ePower Metals Inc (TSXV:EPWR) is a resource exploration company focused on advancing a high-quality portfolio of cobalt projects, with the goal of providing cobalt to the ever-growing rechargeable battery sector. Currently, ePower Metals is dedicated to exploring and advancing its Brokopondo and Panther Creek cobalt properties. The Brokopondo property is located in geopolitically stable and mining-friendly Suriname, South America. Along with having a stable political environment, Suriname offers mining companies established infrastructure, a skilled workforce, low costs of operation and clearly defined mining regulations. The property could offer bulk tonnage potential and ePower Metals is hoping to achieve this by focusing on the model used by Geovic Mining Corp. (OTCMKTS:GVCM) in Cameroon. Additionally, the property has reported historical sample grades of 0.5 percent to 1.5 percent cobalt. ePower Metals has set aside US$350,000 for an initial exploration program which will include property-wide soil sampling and definition auger drilling. The company hopes that auger drilling will enable them to begin drafting a NI 43-101 resource estimate for the property. The Panther Creek property is situated upon Idaho’s cobalt belt, a proven region rich in mining history and historical cobalt mining projects. ePower Metals’ property is located alongside the eCobalt Solutions (TSX:ECS; OTCQX:ECSIF; FRA:ECO) Idaho cobalt property, which has a measured and indicated resource of 45.7 million pounds of cobalt, 65.8 million pounds of copper and 68,000 ounces of gold. To date, the company has conducted soil and rock sampling initiatives, and has filed a plan of operations to permit a stream crossing, road reactivation and a drill program that will test cobalt targets identified in mapping and sampling over the last year. Moving forward, ePower Metals will continue to develop its portfolio using a multi-pronged growth strategy that could include the acquisition of non-core cobalt assets; underperforming cobalt companies; bulk tonnage targets hosted in laterite; and high-grade, narrow-vein, direct-ship ore. To this effect, the company has been investigating potential opportunities in Mexico and South America, where cobalt has been underexplored. ePower Metals is led by a group of executives with a deep understanding of the full mining cycle. This includes company chairman, Alan Savage, who brings 50 years of capital market experience, and CEO Michael Collins, who has worked both in the mining engineering space and in advancing projects towards production with large mining entities. The management team is also significantly invested in the company, holding 16 percent of shares. 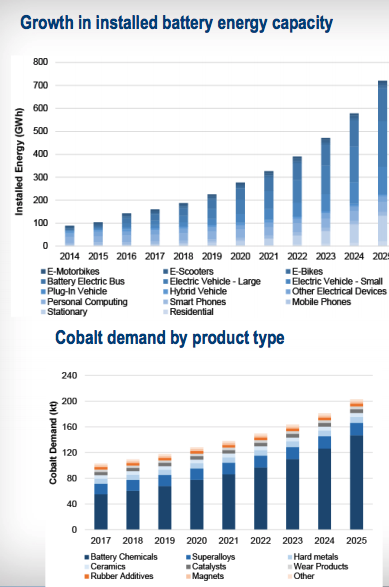 The cobalt market has been facing growing demand in the recent years as it is a key component of lithium-ion batteries used in electric vehicles and consumer electronics. Following this trend, demand is expected to increase by over 90 percent to 203 kilo tonnes by 2025. Within this time period, due to potential market deficits, the cobalt price is also expected to grow to US$34 per pound, up 41 percent from 2017 prices. Within this growing cobalt market, ePower Metals is taking an innovative approach to cobalt exploration. The company is looking to develop projects with cobalt as a primary resource, as opposed to as a bi-product of Cu/Ni and gold or silver projects, as it has commonly been produced. To this effect, ePower Metals is currently conducting exploratory work on its flagship property in Idaho, US. In August 2018, ePower Metals acquired a 100 percent interest in the Brokopondo cobalt property in Suriname, South America. The Brokopondo property is approximately 8,900 hectares in size and is 85 kilometers from Paramaribo, the capital of Suriname. A paved highway creates easy access to the property and high-tension power lines cross the property just north of the Afobaka Hydro Dam. Suriname is geopolitically stable country with clear mining regulations and hosts established infrastructure systems and a skilled workforce needed for mining. These were in part developed through the lifecycle of two historical mines: Iamgold’s (TSX:IMG) Rosebel mine and Newmont’s (NYSE:NEM) Merian Mine. ePower Metals’ target model is similar to that used in the cobalt-manganese deposits delineated in Cameroon. For an example, Geovic Mining Corp. has identified cobalt-manganese mineralization hosted in asbolane and/or lithiophorite minerals with an estimated measured mineral resource of 59.8 million tonnes grading 0.24 percent cobalt, 1.37 percent manganese and 0.68 percent nickel (NI43-101 report; Geovic Mining Corp. Nkamouna and Mada Deposits, June 2, 2011). These resources are historic in nature and while they may have been completed to the standards of the day, they should not be relied upon by the reader. These laterite deposits are formed over tropically weathered ultramafic bodies, which results in the enrichment and concentration of elements such as cobalt, nickel and manganese in the oxide facies. Cobalt mineralization is found in concretions with manganese and nickel. These concretions are amenable to physical upgrading through screening and washing which results in a concentrate, which can be 2 to 4 times higher than run of mine ore. These coarse-grained concentrates can be processed through a conventional crush and vat leach process that typically is simpler and cheaper than processing pure clay or silicate type nickel-cobalt laterite deposits, which require high pressure acid leach processing with associated complex and capital-intensive technologies. Laterite hosted cobalt-manganese deposits tend to be bulk-tonnage, free-digging, low-arsenic sources of cobalt. The company believes these types of deposits are amenable to a simple crush and leach process, which can be designed and built on a timeline that could address the market demand for additional cobalt supply. The Brokopondo property has had some historical mining for placer gold. The property is centered on a 1993 US Geological Survey MRDS occurrence of anomalous cobalt and manganese (0.5 to 1.5 percent cobalt). The grades stated in the USGS report have not been verified by the company and readers are cautioned not to place undue weight on such results. The historical grades are considered relevant; however, the reliability, assumptions, parameters and methods used in preparing the reports are unknown. Due to the historic mining and exploration in the area, the Brokopondo property is crisscrossed with trails which will aid ePower Metals in exploring and developing the property. ePower Metals has set aside US$350,000 for an initial exploration program which will include a property wide soil sampling and definition drilling. The company has begun community consultations and contracted local suppliers and companies. An initial property evaluation has been completed and an exploration program will commence in September, 2018. In October 2017, ePower Metals entered into an option agreement with Utah Mineral Resources LLC (UMR) to earn up to 100 percent interest in the Panther Creek cobalt project. The property includes 3,060 acres of lode mining claims and a 41.3-acre mining lease located in the proven mining jurisdiction of Idaho’s cobalt belt. The property is located 26 miles away from Salmon, Idaho—a supply and transportation center—and is easily road accessible. It is adjacent to eCobalt Solutions’ Idaho Cobalt Project and their Ram cobalt-copper-gold deposit. Mineralization on the property is hosted in the Apple Creek formation and is on trend with mineralized horizons of the historic Blackbird mine. Under the terms of the agreement, the company has already acquired a 50 percent interest in the project having paid UMR US$175,000 and having issued 5.5 million shares to UMR shareholders. The remaining 50 percent interest will be granted following a payment of $150,000 and at least $75,000 in work expenditures within 12 months of the original agreement, and another $150,000 payment plus an additional $100,000 of expenditures on the property within 24 months, and an additional $200,000 of property expenditures within 36 months. UMR is also entitled to receive a 2 percent NSR on all project production. Running for approximately 37 miles across east-central Idaho, the Idaho cobalt belt hosts the largest known cobalt resources in the US. 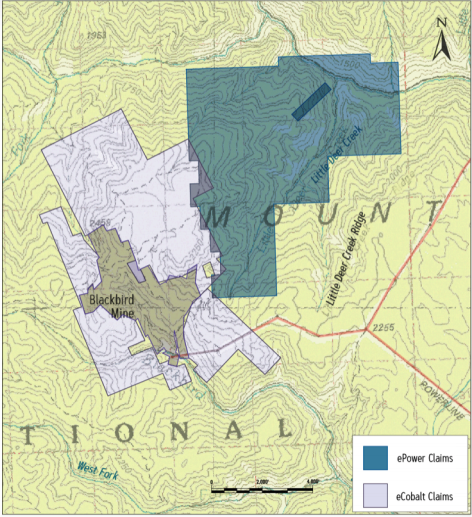 There are a series of historic mines and prospects along the belt including within the central Blackbird mining district which hosts the historic Blackbird Mine as well as eCobalt Solutions’ Ram deposit. The Blackbird Mine reportedly produced nearly 14 million pounds cobalt and more than 53 million pounds copper according to the US Bureau of Mines and published reserves total ~6.5 million tonnes grading 0.55 percent cobalt and 1.31 percent copper (US Geol. Survey, Open File Report 98-478). eCobalt has completed a feasibility study on their Ram deposit with a measured and indicated resource of 3.44 million tonnes at 0.59 percent cobalt and 0.73 percent copper (43-101 Technical Report, eCobalt Solutions Inc, Nov 10, 2017). ePower Metals’ Panther Creek property lies within the Blackbird district adjacent to eCobalt’s Idaho cobalt property and on trend with the mineralized horizons of the Blackbird deposit. The Panther Creek cobalt project has seen limited exploration activities to date. There are three known cobalt-copper showings on the property which were sampled by the US Geological Survey in 1998. These include the Sweet Repose adit, which showed results of 0.46 percent cobalt and 0.27 percent copper, and the Little Deer Creek showing which returned 1.04 percent cobalt and 4.14 percent copper over 3 meters. Additional surface sampling conducted by UMR in 2016 included values from trace to 0.91 percent cobalt and 3.63 percent copper and, in another sample, 0.74 percent cobalt and 0.27 percent copper. The grades and descriptions stated in the USGS reports and by UMR have not been verified by the company, and readers are cautioned not to place undue weight on such results. The historical grades are considered relevant; however, the reliability, assumptions, parameters and methods used in preparing the reports are unknown. Since entering the option agreement for the property, ePower Metals has conducted a sampling program in which they collected 797 soil samples and 14 chip-channel rock samples. The results for the soil samples, announced in January 2018, ranged from 4.7 ppm to 355 ppm cobalt. Meanwhile, assays for the rock samples ranged from trace to 0.37 percent cobalt and 0.014 g/t gold to 19.3 g/t gold. The program also delineated two parallel soil anomalies which intersect historic workings in the two adits and trend towards the Blackbird mine. ePower Metals currently has applied for road reactivation, stream crossing and drilling permits for the property. While they are waiting for the approval of the permits, ePower Metals will be working through their summer work program. The program is focused, in part, on expanding the 2017 soil sample survey, conducting geological and structural mapping and rock sampling to identify targets for trenching and drilling. Additional exploration will be focused on evaluating historic workings on the Long Dike and Little Deer Creek adits, follow up work on anomalous rock and soil samples recovered in the 2017 work program and prospecting for new copper-cobalt-gold mineralization. ePower Metals is also looking into determining the viability of safely entering the historic workings at Long Dike Adit. Alan Savage brings 50 years of experience in the capital markets in North America and offshore to Argus. Among other accomplishments, he was the founder of Imperial Metals Corporation and president and a director of that Company from 1978 to 1986. As President of New Canamin Resources Ltd, he was credited with the discovery and commercial feasibility of the 20,000 TPD Huckleberry copper deposit in British Columbia. He is currently a director of Pacgen Life Science Corp and Epicore Bionetworks Inc, and owns and operates Southern Gold Resources Ltd, a successful investment and venture capital enterprise. Michael Collins is a Professional Geologist with extensive public market and consulting engineering management experience. He worked for 5 years as VP North America with Mining Plus Canada Ltd., a specialized underground and surface mining engineering consulting company. He has also served as management or as a director of five Vancouver based public companies since 2005 and is currently also a director of Nortec Minerals Corp. Over the last 21 years he has developed a strong skill set in mineral exploration, deposit modelling and project development. He graduated with a BSc. Honours from Dalhousie University in 1996. Companies and projects of note include production and exploration at the Red Lake Mine with Goldcorp, exploration work on the South Raglan project in the Ungava Peninsula with Canadian Royalties and as a consulting geologist on cobalt projects in Western Uganda and the Idaho Cobalt Belt. His work has also taken him to such diverse environments such as East Africa, Central and South America and Southeast Asia. Simon Anderson is a Chartered Accountant with extensive experience in financial reporting, corporate finance and management with public companies. He is a director or officer of several Canadian and US-listed companies ensuring public disclosure meets current standards and planning and implementing acquisitions and divestitures. Previously, he was a partner with an international accounting and consulting firm practicing in the areas of business valuation, mergers and acquisitions and business planning services. Nancy Curry brings over 25 years of financial market, strategic planning, marketing & communications and management of public company experience to ePower Metals Inc. Curry began her career working in the investment industry and has worked for several national investment dealers specializing in futures trading. Her public company experience began in 1995, she has worked with several resource and technology companies leading and implementing multifaceted stakeholder communications, before starting her own communications firm in 2014. One of her firm’s clients was eCobalt Solutions Inc. for a period in 2015 & 2016, where she focused on strategic planning and corporate rebranding. Curry was VP Corporate Communications for Diamonds North Resources Ltd. (2002 – 2010), where the company was nominated twice for Best Investor Relations by a TSX Venture Company by IR Magazine. Bruce Kienlen is a professional geologist with more than twenty years of experience working with junior and major exploration companies. He has served as senior geologist with Canterra Minerals and Independence Gold, VP Exploration for Diamonds North Resources and project geologist for BHP Billiton. Kienlen has been responsible for project generation, new project assessments, and regional and brown fields exploration programs on many early stage exploration projects in a variety of commodities. He has extensive operational and logistical experience and technical expertise in geochemical evaluation. He played a key role in the discovery of the diamondiferous Repulse Bay (Qilalugaq) and Amaruk kimberlite fields. Tyler Ross has 18 years of capital market work experience. He has been involved in every stage of business development from inception through to exit. Mr. Ross has worked with many successful public companies, including Fronteer Gold, which went on to sell its asset to Newmont for $2.5-billion. Mr. Ross was also a consultant to Fission Uranium, which was a uranium discovery in the prolific Athabasca basin that went on to be sold to Denison for $80-million. Mr. Ross was also a consultant to Mira Resources, a Nigerian junior oil exploration company. Mr. Ross was also responsible for finding and financing Tranzeo Wireless from its seed round financing until its eventual initial public offering to the senior Toronto Stock Exchange at over $1.50 per share. Dr. Gregg C. Bruce graduating with a PhD. in chemistry from University of Victoria in 1992 and started work as Project Manager for the USAF large rechargeable Lithium cell development program. The timing of this initial assignment was fortuitous since it coincided with commercialization, by Sony in 1991, of the Lithium Ion battery. The performance of these cells was a very important initial step in the development of large Li Ion cells for space and defense applications and the subsequent commercialization and mass production of lithium batteries. It was during this period where he was recognized as one of a handful of North American Lithium Ion technical experts. For the past seventeen years he has been involved in the development and manufacture of Lithium Ion batteries for implantable medical applications. During the same period of time he has also been involved in the commercialization of Li/MnO2 cell chemistry producing the world’s smallest implantable battery using Li/MnO2 cell chemistry. More recently his work has focused on Li/CFx-MnO2 battery technology and this work has resulted in the award by the US Army for the production of the BA-5790/U battery for man portable devices. Michael Kobler has over 35 years of experience in the resource sector, specializing in identifying, acquiring, developing and producing natural resource opportunities throughout the world. This experience includes overseeing the design and construction of a number of mining and tunnelling projects. Currently CEO and Director of American Lithium, Kobler has served in a variety of roles for early stage companies including, Chairman, Chief Executive Officer, President, Technical Advisor, Engineer and Project Manager, along with being a major shareholder in a number of these ventures. Kolber has focused his career in North and South America, which has included exploration and mine planning projects at El Pauji in Venezuela as well as mine planning and development projects for HW Mining at La Serena and El Teniente in Chile. In North America, Kobler was involved in developing the mine at the Sacaton Shaft in Casa Grande, Arizona and helped develop the Amethyst Mine at Creede, Colorado for HW Mining. In 2005, Kobler was a Co-Founder and the original CEO of Osum Oil Sands Corp. (“Osum”) where he oversaw the analysis and acquisitions of the original oil sands leases that form the core of Osum’s projects at Cold Lake and the Saleski carbonates, both in Alberta. During his tenure with Osum, Kobler oversaw the growth of the company from start-up to a valuation approaching $500 million; he also hired his successors to ensure the smooth transition of the company to its next phase of growth and an equity value approaching $2 billion. Fred Tejada is a professional geologist, registered in British Columbia. He has 30 years of international mineral industry experience and has a proven track record, working with both major and junior mining and exploration focused organizations. He was Country Manager for Phelps Dodge Exploration Corporation in the Philippines with responsibility over corporate and technical matters, development of exploration strategy and acquisitions. He is President and Director of Tirex Resources Ltd. and previously held the position of Vice President for Exploration of Panoro Minerals Ltd. where he directed the resource definition drilling of its two major copper projects in Peru. He is also active as a director with Coronet Resources Inc.
*Disclaimer: The profile provides information which was sourced and approved by ePower Metals Inc in order to help investors learn more about the company. ePower Metals Inc is a client of the Investing News Network (INN). The company’s campaign fees pay for INN to create and update this profile page, to which links are placed on Investingnews.com and channel newsletters. By completing this form, you are giving consent to receive communication from ePower Metals using the contact information you provide. And remember you can unsubscribe at any time.